The Emerald Ash Borer (EAB) is an insect that belongs to a group of metallic wood-boring beetles. Unlike our native beetles that kill weakened trees as part of the natural nutrient recycling process, emerald ash borers kill vigorously growing and weakened ash trees. It is not native to the United States and was first found near Detroit, Michigan in 2002. EAB is now found in 21 states and has already killed tens of millions of ash trees. EAB was discovered in Georgia in July 2013 as part of the national detection survey funded by the USDA - Animal and Plant Health Protection Inspection Service, Plant Protection and Quarantine. Georgia has been part of a nationwide trapping program to detect the presence of this forest pest since 2005. Initially, the Georgia Dept. 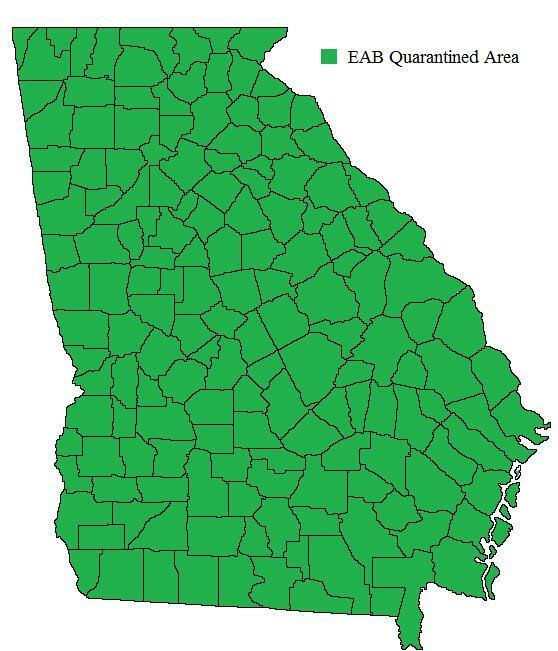 of Agriculture and the Georgia Forestry Commission quarantined only the counties where EAB was detected. After the 2016 trapping season, both agencies agreed that the northern part of the state should be quarantined. In December, 2017 both agencies decided to quarantine the entire state.